Lead form plugin is one of the most user friendly plugin on WordPress for creating lead generation forms for your WordPress site. Just upload the lead-form-builder.zip to the /wp-content/plugins/ directory, and then activate it from ‘Plugins’. To create a new form navigate to “WP Dashboard > Lead Form > Add Form“. 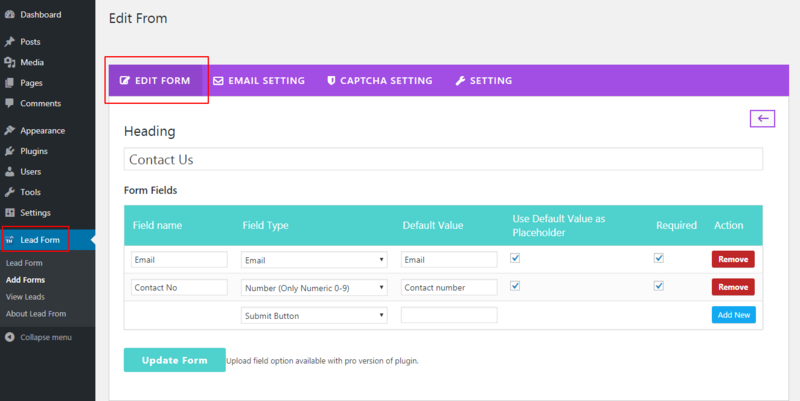 Add Field Name, Field Type, Default Value, Use Default Value as a Placeholder (check this option to show default value inside fields), Required (Check this option to make that particular field mandatory/required), Add New Button (Click to add more fields). Field ordering & Customization : To order form fields just drag and drop them. FYI – Add “Terms and Condition check box” from the field type option. You can put your Terms of services in field name and set it as required. For showing contact form Navigate to Page > Editor > Paste the form Shortcode and Publish it. If you want to display Contact form in your widget area go to the Appearance > Widget. Click on form builder widget and choose the desired widget area and add form shortcode in it. You can edit your form, drag & drop any field, change the text of field. Navigate to Lead Form > Edit Form. Here you can edit your form. This section lets you customize lead receiving and lead sending detail. Go to WP Dashboard > Edit form > Email Setting. Admin Email: Admin Email: Here you can set “To” which email id admin want to send mail and “From” which email id admin want to receive mail. 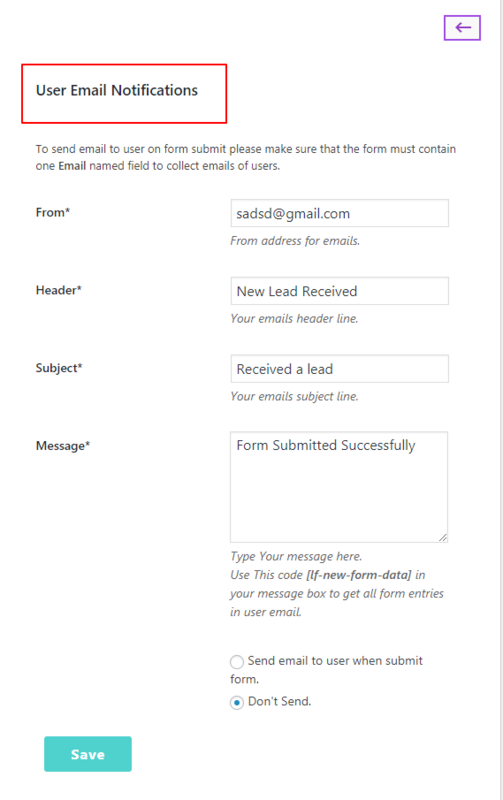 For sending the leads detail with your email you should put the shortcode [lf-new-form-data] in the message body and you can write any message too. User Email: Here you can set “From” which email id you want to send email to user after form submitting. 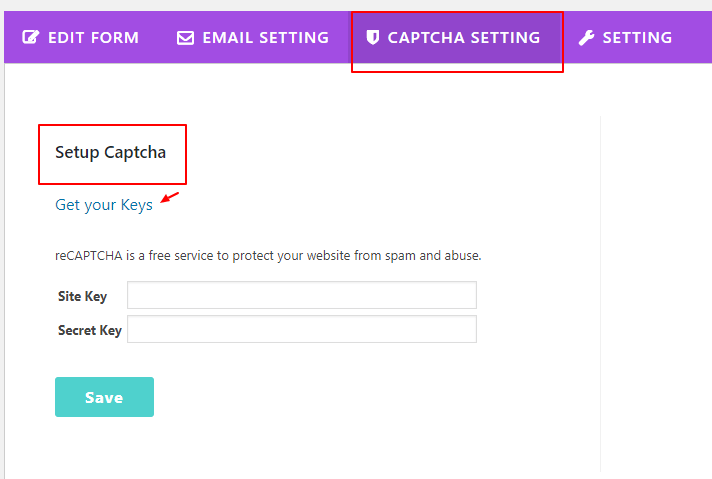 You can also set whether you want to send email to the user or not. Message: Add this shortcode in the message body [lf-new-form-data] to receive complete message submitted by user. Receive leads in email – You will receive your lead in email. Save leads in database – You can save leads in your database. Receive leads in email and save in database – You will receive your leads in your emails and database both. 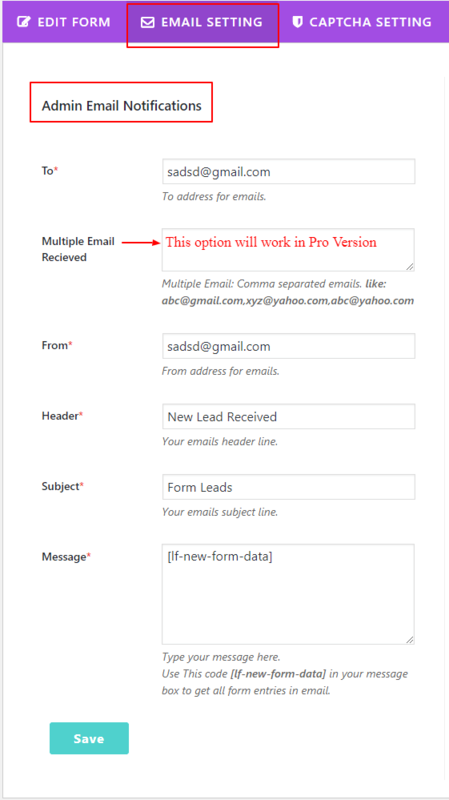 For more options Go with the Pro version of Lead form builder. And you can also contact our support team at support forum. for any query.